Glauconite: Mineral information, data and localities. Blue-green, yellow-green, green, rarely colorless. Glauconites are dioctahedral interlayer-deficient micas (as are illites). 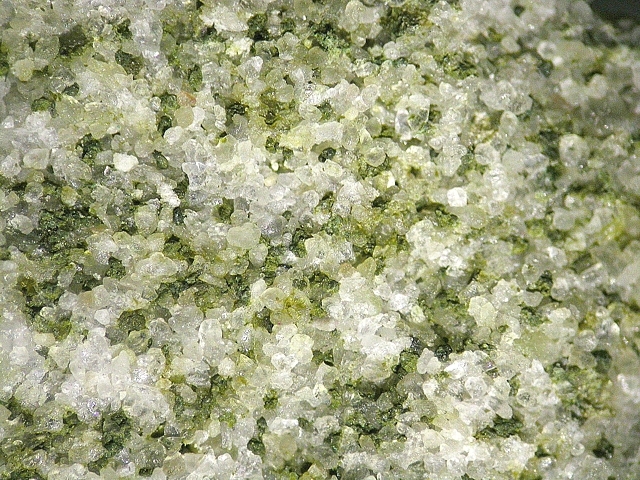 Typically found as rounded aggregates or "pellets" of very fine grained scaly particles, having a blue-green to yellow-green color. True glauconites may have been found in other environments, but, before 1998, may have been classed as celadonite. Mesoproterozoic to Carboniferous : 1175 Ma to 354 Ma - based on 18 recorded ages. Crystals extremely rare; typically found as rounded aggregates of very fine grained scaly particles, more rarely as tiny laths or platelets. The most common polytype is 1M. The -1M and -3T polytypes cannot be distinguished by the powder pattern. Cuprian Glauconite A 2M polytype mica, glauconite variety, containing up to 2.02 wt.% CuO and anomalously rich in Na2O (over 6 wt.%) and MgO (over 7 wt.%), by up to 1.13 wt.% FeO. Soda-Glauconite A Sodium-rich variety of Glauconite. Calcite 9 photos of Glauconite associated with Calcite on mindat.org. Quartz 3 photos of Glauconite associated with Quartz on mindat.org. Zircon 3 photos of Glauconite associated with Zircon on mindat.org. Gypsum 3 photos of Glauconite associated with Gypsum on mindat.org. Clays 3 photos of Glauconite associated with Clays on mindat.org. Pyrite 2 photos of Glauconite associated with Pyrite on mindat.org. Aegirine 1 photo of Glauconite associated with Aegirine on mindat.org. Schneider, H. (1927) A study of glauconite. Journal of Geology: 35: 289-310. Hendricks, S.B., Ross, C.S. (1941) Chemical composition and genesis of glauconite and celadonite. American Mineralogist: 26: 683-708. Bentor, Y.K., Kestner, M. (1965) Mineralogy and origin of glauconite. Journal of Sedimentary Petrology: 35: 155-166. Sakharov, B.A., Besson, G., Drits, V.A., Kameneva, M.Y., Salyn, A.L., Smoliar, B.B. (1990) X-ray study of the nature of stacking faults in the structure of glauconites. Clay Minerals: 25: 419-435. Dainyak, L.G., Drits, V.A., Heifits, L.M. (1992) Computer simulation of cation distribution in dioctahedral 2:1 layer silicates using IR-data: Application to Mössbauer spectroscopy of a glauconite sample. Clays and Clay Minerals: 40: 470-479. Gaines, R.V., Skinner, H.C.W., Foord, E.E., Mason, B., Rosenzweig, A., King, V. (1997) Dana's New Mineralogy : The System of Mineralogy of James Dwight Dana and Edward Salisbury Dana: p. 1453. Journal of the Royal Society of Western Australia, Vol 19, p13, ES Simpson and CR Le Mesurier. Strasser, M. (2008): Lapis, 33 (5), 40-43. Bertram, E. F., & Mellon, G. B. (1975). Peace River iron deposits (Vol. 75). Alberta Research Council. A.P. Sabina, "Rocks and Minerals for the Collector - Northeastern Nova Scotia, Cape Breton, and Prince Edward Island", GSC Paper 65-10, 1965.
ⓘ Huidong lead-zinc mine (Daliangzi Pb-Zn deposit) ? ⓘ Tianbaoshan Zn-Pb-Ag deposit ? Chernoff, C.B. and Orris, G.J. (2002): USGS Open-File Report 02-156-A. Rusek P., Valošek Č.: Zpráva o výsledku geologicko-mineralogických pochůzek v okr. Karviná a Frýdek-Místek (květen-srpen 1960; 15. část). Zprávy Okresního muzea v Českém Těšíně, 1960, č. 26. Jirásek, J., Dolníček, Z., Matýsek, D., & Urubek, T. (2017). Genetic aspects of barite mineralization related to rocks of the teschenite association in the Silesian Unit, Outer Western Carpathians, Czech Republic. Geologica Carpathica, 68(2), 119-129. Mátl, V.: Ložiska sádrovce opavské pánve. Geologický průzkum, 1981, č. 12, s. 346-350. P. Andresen (2002, collected ). 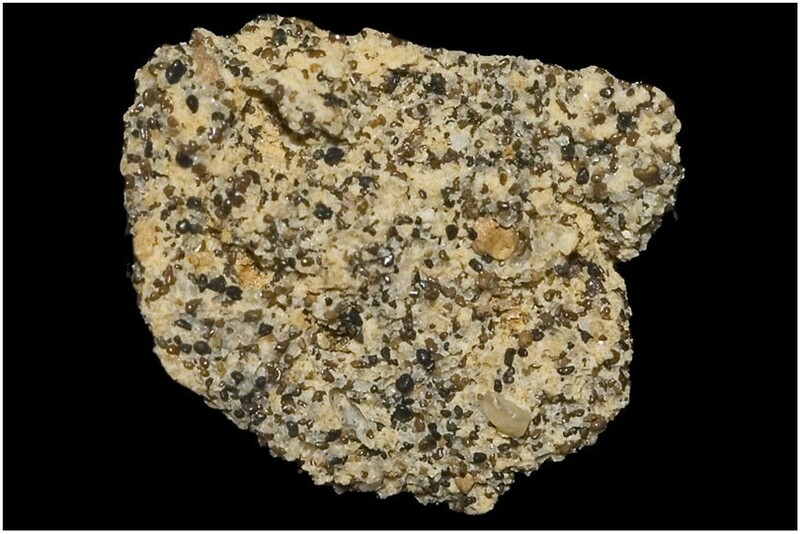 Ordoñez, Marta (2006): MICROPALEONTOLOGÍA ECUATORIANA. CIGG: PETROPRODUCCION. p :95,96,97. G. Demarcq, 1973, "Guides Géologiques Régionaux : Lyonnais, Vallée du Rhône" , p.110, Masson. G. Demarcq, 1973, "Guides Géologiques Régionaux : Lyonnais, Vallée du Rhône" , p. 62, Masson. Heavy sands collected by Marc Bassoulet - Photo and collection François Périnet. Baret, Ch. (1905): Catalogue de la Collection de Minéralogie de la Loire-Inférieure, Muséum de Nantes, 119. Aust H. (1969) Lithologie, Geochemie und Paläontologie des Grenzbereiches Muschelkalk-Keuper in Franken. Abhandlungen des Naturwissenschaftlichen Vereins Würzburg, Band 10. Kaeding, L., Brockamp, O., Harder, H. (1983): Submarin-hydrothermale Entstehung der sedimentären Mangan-Lagerstätte Úrkút/Ungarn. Chem. Geol. 40, 251-268 (in German). - Bassani F. (1907): Su alcuni avanzi di pesci nell'arenaria glauconiosa delle Isole Tremiti. Rend. R. Acc. sci. fis. mat. Napoli, 46, 156-160. - Iaccarino S., Foresi L.M., Mazzei R., Salvatorini G. (2001): Calcareous plankton biostratigraphy of the Miocene sediments of the Tremiti Islands (southern Italy). Revista Española de Micropaleontologia, 33, 2, 237-248. Iaccarino, S., Foresi, L.M., Mazzei, R., Salvatorini, G. (2001): Calcareous plankton biostratigraphy of the Miocene sediments of the Tremiti Islands (southern Italy). Revista Española de Micropaleontologia, 33, 2, 237-248. Guarino V., Fedele L., Franciosi L., Lonis R., Lustrino Michele, Marrazzo M., Melluso L., Morra V., Rocco I., Ronga F. (2011): Mineral compositions and magmatic evolution of the calcalkaline rocks of nortwestern Sardinia, Italy. Per. Mineral., 80, 3 (Spec. Issue), 517-545. Resch, W. (1979): Zur Fazies-Abhängigkeit alpiner Trias-Foraminiferen. Jahrb. Geol. B.-A., 122, 1, 181-249. Dill, H.G., Kus, J., Abed, A.M., Sachsenhofer, R.F., Abul Khair, H. (2009) Diagenetic and epigenetic alteration of Cretaceous to Paleogene organic-rich sedimentary successions in northwestern Jordan, typical of the western margin of the Arabian Plate. GeoArabia, 14(2), 101-140. Blaser, R. (1952) Geologie des Fürstentums Liechtenstein. 2. Teil. Geologie des nördlichen Gebietes Schellenberg, Drei Schwestern-Gruppe und Umgebung von Vaduz. Mit Anhang: Fläscherberg. Selbstverlag des Historischen Vereins für das Fürstentum Liechtenstein, Vaduz, 228 pp. ; Allemann, F. (1956) Geologie des Fürstentums Liechtenstein. 3. Teil. Geologie des südlichen Gebietes Falknis, Lawena, Triesenberg. Unter besonderer Berücksichtigung des Flyschproblems. Selbstverlag des Historischen Vereins für das Fürstentum Liechtenstein, Vaduz, 244 pp. Frommelt, A. (1934) Steinbruch Limseneck, Ruggell. Jahrbuch des historischen Vereins für das Fürstentum Liechtenstein, Bd. 34, 18-32; Blaser, R. (1952) Geologie des Fürstentums Liechtenstein. 2. Teil. Geologie des nördlichen Gebietes Schellenberg, Drei Schwestern-Gruppe und Umgebung von Vaduz. Mit Anhang: Fläscherberg. Selbstverlag des Historischen Vereins für das Fürstentum Liechtenstein, Vaduz, 228 pp. John Attard and Alfredo Petrov collections. Alfredo Petrov - field observations. Alfredo Petrov field observations, and geological map of Gozo. Nijland, T.G., Zwaan, J.C., Visser, D. and J. Leloux (2007) Geologie van Nederland - De mineralen van Nederland. Knnv, Uitgeverij. 104p. van Der Lingen, G.J. (1988) Lower Tertiary transgressive sediments of the Broken River Formation, Mt Somers area, Canterbury, New Zealand. New Zealand Journal of Geology and Geophysics, 31:3, 287-304. Campbell, H.J., Andrews, P.B., Beu, A.G., Edwards, A.R., Hornibrook, N. deB., Laird, M.G., Maxwell, P.A., Watters, W.A. (1988) Cretaceous-Cenozoic lithostratigraphy of the Chatham Islands. Journal of the Royal Society of New Zealand, 18:3, 285-308. H.-R. Kudrass & U. von Rad (1991): Phosphoritexploration auf dem Chatham Rise/ Neuseeland. Geologisches Jahrbuch, D93, 23-40. Aitchison, J.C. (1988) An Eocene generated littoral placer Northeast Otago, New Zealand Journal of Geology and Geophysics, 31:3, 381-383. Hood, S.D., Nelson, C.S., Kamp, P.J.J. (2002) Petrogenesis of the Tikorangi Formation fracture reservoir Waihapa-Ngaere field Taranaki Basin, 2002 New Zealand Petroleum Conference Proceedings, 24-27 February 2002. Wezenburg, U. (1988) An engineering geological investigation of batter stability, Weavers open cast coal mine, Huntly (unpublished thesis, MSc), University of Canterbury. Browne, G.H. (1987) In situ and intrusive sandstone in Amuri fades limestone at Te Kaukau Point, south-east Wairarapa, New Zealand. New Zealand Journal of Geology and Geophysics, 30:4, 363-374. Alexander I. Tischenko (1996). Minerals of the Crimea. - World of stones, 1996, #9, p.9 - 18. Skublov, G. T., Marin, Y. B., Semikolennykh, V. M., Skublov, S. G., & Tarasenko, Y. N. (2007). Volkhovite: A new type of tektite-like glass. Geology of Ore Deposits, 49(8), 681-696. Feklichev, V.G. [Фкеличев, В.Г.] (1998) Mineral diversity of the Moscow region [Минералогическое разнообразие Подмосковья]. Sredi Mineralov (Almanac) [Среди минералов (альманах)], 103-112 (in Russian). Velasco, F., Herrero, J. M., Yusta, I., Alonso, J. A., Seebold, I., & Leach, D. (2003). Geology and geochemistry of the Reocín zinc-lead deposit, Basque-Cantabrian basin, Northern Spain. Economic Geology, 98(7), 1371-1396. Kipfer, A. (1984): Die Mineral-Paragenese im Schrattenkalk des Steinbruchs 'Waag' (Unteriberg, Kt. Schwyz). Schweizer Strahler, 1984, Nr. 9, 393-404. Stalder, H. A., Wagner, A., Graeser, S. and Stuker, P. (1998): "Mineralienlexikon der Schweiz", Wepf (Basel), p. 349. Bouhlel, S., Leach, D. L., Johnson, C. A., Marsh, E., Salmi-Laouar, S., & Banks, D. A. (2016). A salt diapir-related Mississippi Valley-type deposit: the Bou Jaber Pb-Zn-Ba-F deposit, Tunisia: fluid inclusion and isotope study. Mineralium Deposita, 1-32. Decrée, S., Marignac, C., De Putter, T., Deloule, E., Liégeois, J.P., and Demaiffe, D. (2008): Ore Geology Reviews 34, 285-303. Dill, Weiss, Botz, Dohrmann, Paleontological, mineralogical and chemical studies of syngenetic and epigenetic Pb–Zn–Ba–P mineralizations at the stratotype of the K/P boundary, International Journal of Earth Sciences, Feb 2010. Souissi, F., Dandurand, J.L., and Fortuné, J.P. (1997): Mineralium Deposita 32, 257-270. Bloodworth, A. J. (1990). Mineralogy and petrography of borehole samples taken from landslipped Gault Clay, Shaftesbury, Dorset. Loveland, P.J. (1980) Zoned Glauconite from the Upper Greensand. Mineralogical Magazine 43(329), 682-684. Anthony, J.W., et al (1995), Mineralogy of Arizona, 3rd.ed. : 233. Anthony, J.W., et al (1995), Mineralogy of Arizona, 3rd.ed. : 233; Lindgren, W. (1905), The copper deposits of the Clifton-Morenci district, AZ, USGS PP 43. Anthony, J.W., et al (1995), Mineralogy of Arizona, 3rd. ed. : 233; Wilson, E.D. (1944), Arizona nonmetallics: A summary of past production and present operations, AZ Bur. of Mines Bull. 152; Galbraith, F.W. 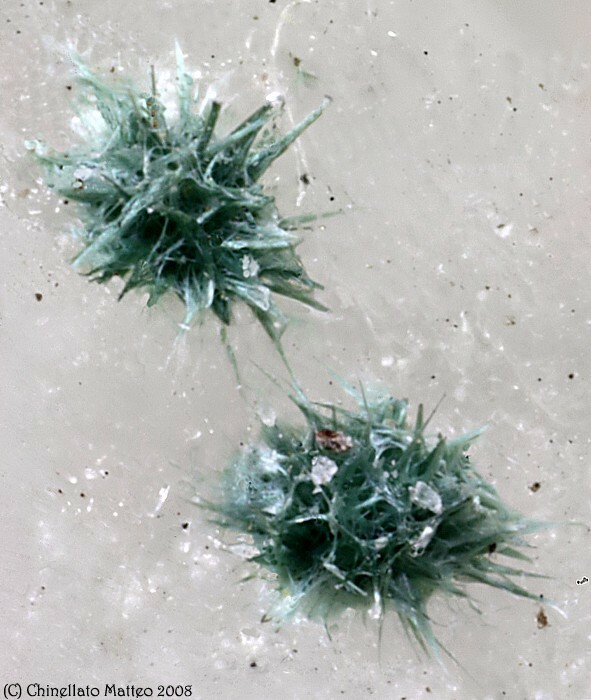 & Brennan (1959), Minerals of AZ: 107. Allen, Victor T. (1929), The Ione formation of California: University of California, Department of Geological Sciences Bulletin: 18: 369; Murdoch, Joseph & Robert W. Webb (1966), Minerals of California, Centennial Volume (1866-1966): California Division Mines & Geology Bulletin 189: 200; Pemberton, H. Earl (1983), Minerals of California; Van Nostrand Reinholt Press: 429. Reed, Ralph Daniel (1928), A siliceous shale formation from southern California: Journal of Geology: 36: 347; Murdoch, Joseph & Robert W. Webb (1966), Minerals of California, Centennial Volume (1866-1966): California Division Mines & Geology Bulletin 189: 200; Pemberton, H. Earl (1983), Minerals of California: 429. Schneider, H. (1927) A study of glauconite. Journal of Geology: 35: 296-298; Pemberton, H. Earl (1983), Minerals of California; Van Nostrand Reinholt Press: 429. Briggs, L.I., Jr. (1951), Jarosite from the California Tertiary, American Mineralogist: 36: 902; Briggs, L.I., Jr. (1953), Geology of the Ortigalita Peak quadrangle, California: California Division Mines & Geology Bulletin 167: 40-41; Murdoch, Joseph & Robert W. Webb (1966), Minerals of California, Centennial Volume (1866-1966): California Division Mines & Geology Bulletin 189: 200; Pemberton, H. Earl (1983), Minerals of California: 429. Galliher, Edgar Wayne (1935a), Glauconite genesis: Geological Society of America Bulletin: 46: 1359; Galliher, Edgar Wayne (1935b), Geology of glauconite: American Association of Petroleum Geologists Bulletin: 19: 1580; Murdoch, Joseph & Robert W. Webb (1966), Minerals of California, Centennial Volume (1866-1966): California Division Mines & Geology Bulletin 189: 200; Pemberton, H. Earl (1983), Minerals of California; Van Nostrand Reinholt Press: 429. Dietz, R.S., K.O. Emery & F.P. Shepard (1942), Phosphite deposits on the sea floor off southern California: Geological Society of America Bulletin: 53: 819; Murdoch, Joseph & Robert W. Webb (1966), Minerals of California, Centennial Volume (1866-1966): California Division Mines & Geology Bulletin 189: 200; Pemberton, H. Earl (1983), Minerals of California; Van Nostrand Reinholt Press: 429. DHZ, Vol. 2B, 2nd ed., p 663. Dana, E.S. (1892) System of Mineralogy, 6th. Edition, New York: 1070. Goldstein, A. (2010) Mineral News, 26, #8, 9-10. Barwick, Authur R. (1951) Vivianite Concretions in Aquia Formation (Middle Eocene), Anne Arundel County, Maryland, American Mineralogist, 36: 629--630. Pearre, Nancy (1961) Mineral deposits of Maryland excluding fuel, sand and gravel: U.S. Geological Survey Mineral Investigations Resources Map MR-12. Bernstein, Lawrence (1976) Minerals of Washington D.C. and vicinity: U.S. Geological Survey: Open File Report 76-849, 183 p.
Weed, E.G. A. (1988): Mesozoic and Tertiary Stratigraphy of Cape Cod and Nearby Islands, in Hatch, N.L., Jr., editor, 1988, The bedrock geology of Massachusetts: U.S. Geological Survey, Professional Paper 1366-A-D.
Morris, T. Jnr. (1983) Michigan Mineralogy: A Locality Index. Rocks & Minerals, 58:3, 107-113. Minnesota's Geology (1982) Ojakangas, R. W. and Matsch, C. L.
Swann, Charles T. and Saunders, James A. (1992), Cap Rock Geology of the Hazlehurst Salt Dome, Copiah County, Mississippi, Gulf Coast Association of Geological Societies Transactions: 42: 697-705. Victor T. Allen (1937) A Study of Missouri Glauconite. American Mineralogist Vol 22 No 12: 1180-83; Jay M. Gregg (1985) Regional epigenetic dolomitization in the Bonneterre Dolomite. Geology Vol 13: 503-506. E. D. Cope (1869) On some Cretaceous Reptilia. Proc. Acad. Nat. Sci.Philadelphia 20: 233-242. A Quest for New Jersey Minerals, Robert Speiser(1978):8. The Minerals of NYC & Its Environs, NY Min. Club Bull. Vol. 3, No. 1, Manchester, J.G. (1931): 69. The Minerals of NYC & Its Environs, NY Min. Club Bull. Vol. 3, No. 1, Manchester, J.G. (1931): 71. The Minerals of New York City & Its Environs, New York Mineralogical Club Bull., Vol. 3, No. 1, Manchester, J.G. (1931): 72. NJ State Geol. Ann. Rpt. (1892):199. The Minerals of New York City & Its Environs, New York Mineralogical Club Bull. Vil. 3, No. 1, Manchester, J.G. (1931): 80. The Minerals of New York City & Its Environs, New York Mineralogical Club Bull. Vol. 5, No. 1, Manchester, J.G. (1931): 89. Tedrow, J. C. F. (2002) Greensand and Greensand Soils of New jersey: A Review, Rutgers University, New Brunswick, NJ, PP. 40. The Minerals of New York City & Its Environs, New York Mineralogical Club Bull., Vol. 3, No. 1, Manchester, J.G. (1931): 78. Berryhill, H. L. (1963) Geology and coal resources of Belmont County, Ohio. U.S. Geological Survey Professional Paper 380, 113 pp. Wharf Resources, Inc. and RESPEC (2011), Wharf expansion project, conditional use permit application, Topical Report RSI-2196. 104 pp. Odom, I. E., editor, 1978, Lithostratigraphy--Petrology and sedimentology of Late Cambrian--Early Ordovician Rocks Near Madison, WI, Wis. Geol. Nat. Hist. Survey, Field Trip Guidebook 3, p. 142. Ekern, G. I. & F. T. Thwaites (1930) The Glover Bluff Structure: a disturbed area in the Paleozoics of Wisconsin: Transactions of the Wisconsin Academy of Science, Arts and Letters: 25: 89-97..
Thwaites, W. H. & F. T. Twenhofel (1921) Windrow Formation: an upland gravel formation of the driftless and adjacent areas of the upper Mississippi Valley: Geological Society of America Bulletin: 32 (2): 293-314. Cordua, W. (1989) Goethite pseudomorphs after marcasite, Maiden Rock, Wisconsin: Rocks and Minerals: 64(2): 124-127. Fleitmann, D., Matter, A., Burns, S.J., Al-Subbary, A., Al-Aowah, M.A. (2004) Geology and Quaternary climate history of Socotra. Fauna of Arabia 20, 27-43. Zwaan, J.C., Seifert, A.V., Vrana, S., Laurs, B.M., Anckar, B., Simmons, W.B., Falster, A.U., Lustenhouwer, W.J., Muhlmeister, S., Koivula, J.I., Garcia-Guillerminet, H. (2005) Emeralds from the Kafubu area, Zambia. Gems and Gemology 41, 116-148.